Life Before the Dinosaurs: Aysheaia. Aysheaia was a peculiar lobopod from the Cambrian period found in the Burgess Shale and the Wheeler Shale. It resembled a caterpillar in many ways, except for the arm-like appendages sticking out of the anterior end. It had a circle of spike-like appendages around the mouth, which could have helped it eat. Aysheaia probably ate sponges because fossils of it have been found near remains of sponges. Aysheaia was probably related to the living velvet worm Peripatus. 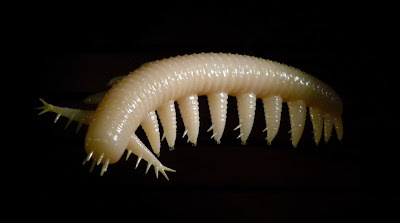 The largest specimens of Aysheaia are a little over two inches long. The ring of spikes around its mouth could have helped it chew up sponges. Ayesheaia had ten pairs of lobe-like legs, and each leg had a claw at the end which could have helped it hold onto sponges as it was feeding. There are 39 specimens of Aysheaia. Twenty of them are from the Phyllopod bed in the Burgess Shale. 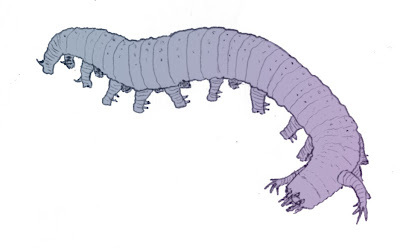 Aysheaia probably had to avoid predators such as Anomalocaris, Hurdia, and Amplectobelua. 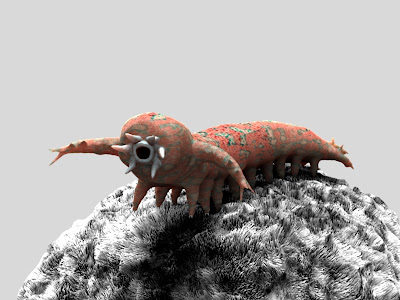 It probably crawled across the sea floor in search of sponges, and when it found a sponge, it would crawl up the sponge and start feeding on it. Sponges, especially the bush-like Vauxia, could have also served as protection from predators.